From Mesopotamian brewers seven thousand years ago to microbreweries in 21st century Brooklyn, beer has captivated mankind in countless ways. There's an undeniable allure to the idea of transforming one's kitchen into a home brewery, and Brew It! 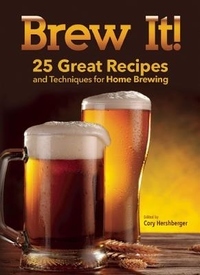 is the simplest, most user-friendly guide available for beginning brewers ready to start beer making today. A complex concoction involving a little chemistry, biology, and physics, beer is essentially a multi-step process of fermentation. This colorful DIY guide demystifies malt, hops, and yeast and will soon be leading readers toward amber mugs of all-grain beer! From brew day to bottle day to game day-- Brew It! guides home brewers from the initial stages of preparing for their first batch to the satisfying suds of a job well done! A tour of the world's most alluring brews: the ales of Ireland, the Pilseners of Germany, the stouts of Belgium, and the pale ales of the U.S.